I’m reprinting the day-to-day journal entries of a cross-country bike tour my friend and I took in 1984. The weblog begins at TransAmerica Tour 1984. We spent much of today in the small gears, the stump-pullers, the grannies. The old ghost town of Jerome was only about 4 miles away, but 2,000 feet above us. 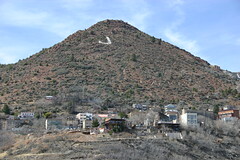 From the brush along Route 89, we could see the town sitting on the edge of a mountain, with a big white letter “J” adorning a slope above it. Although it’s billed as a ghost town, it’s more of a tourist attraction and artists’ colony. We had plenty of opportunity to appreciate its ghostly appearance as we inched our way up, though. Some buildings looked well-kept, while some big old copper mining structures were in various stages of decay. Along the way I heard a rhythmic plicking from the rear wheel, then a clang. I removed it at the side of the road, disengaged my rear brake so it wouldn’t rub the out-of-true wheel (who needs a rear brake going up this hill?) and continued. I put in a new spoke and re-trued the wheel up in Jerome while we stopped for a snack. And tightened the brake. As it turned out, Jerome wasn’t at the crest of the hill. The road kept climbing. From the roadside we could look down across the parched landscape to the ghost town, the Verde River valley, and the Mogollon Rim in the distance. We learned we were on Mingus Mountain. Bruce picked up a twig. “This is Mingus Mountain,” he said. Then he snapped it. I broke up laughing. We finally made it to the top of the 12-mile climb, hitting 7,000 feet of elevation, then plunged downhill through Yaeger Canyon and into the Chino Valley. We climbed back into the forests of the Prescott National Forest, then into Prescott. Jim found us there, and we had a couple of beers at some old cowboy saloon. Bruce bought a new chain and we rode a few miles out of town to the White Spar Campground. Spaghetti and vino for dinner again; Jim showed up just in time to help us finish the bottle in this forested setting. Note: Photo above from Sam Kimpton at flickr.com. Don’t have any pictures from that day for some reason. Headline: July 13, 1984 — Walter Mondale picks Geraldine Ferraro as his running mate on the Democratic ticket to face President Reagan and Vice President Bush in the fall. We didn’t pay too much attention to Friday the 13th. We climbed four miles and 2,000 feet to Jerome, which was fun except that Bis broke a spoke. We fixed it in town (the town is on a steep hill and laid out in tiers) and had breakfast before tackling the hard part of the day: Mingus Mountain; 12 miles up to 7,200 feet. But it was easy for us and we thoroughly enjoyed it. From the top we coasted for about 10 miles and finally rode the remaining 16 into Prescott. It turns out the grating in my pedals was a worn chain, so I bought a new one in Prescott. I should replace the freewheel as well (I may have to–they wear together) but with only seven days to go, I’m going to try to avoid it. We met Jim in town and drank three beers at the Palace Bar on Whiskey Row on Montezuma Street. The bar is 104 years old [and looked it]. We are now camped at White Spar Campground. Our site is surrounded by huge rocks and evergreens and it has finally stopped raining. We learned that we are in monsoon season here in Arizona. There’s lots of humidity.